St Augustine's began in 1838 when Jesuits arrived to found a small mission. The first St Augustine's Church was built on the corner of Hanover Rd and Grosvenor Rd, where Tesco's now stands and although there were only 50 Catholics within walking or riding distance - a church big enough for 250 people was built. Jesuit priests nurtured the small community until 1866, when it was handed over to Thomas Grant, the first Bishop of Southwark. Our first diocesan priest at St Augustine's was Fr (later Canon) Joseph Searle. Fr Stevenson fell ill, and then died. In the intervening years a mass centre had been opened in Southborough, to eventually become the separate parish of St Dunstan's but mass centres in Ramslye, Penshurst, Sherwood and Rusthall came and went. The major change in Fr Bill's time was the closure of the old church in 1967 and the new Church built on its current site in the 1970s. Fr Bill served the parish with tremendous dedication for 36 years, 28 years as parish priest, building a thriving parish community which went from strength to strength. Following several years of failing health He died in 2008 at St George's Retreat Burgess Hill. He is fondly remembered by all those who knew him. He was succeeded as Parish Priest by Canon Michael Evans, (subsequently Bishop of East Anglia Diocese - Bishop Michael died in July 2011) and in 2003 by Canon Peter Stodart. 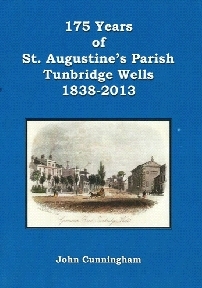 A new parish history - 175 Years of St. Augustine's Parish by John Cunningham which shows in greater detail the beginnings of our parish from a large Jesuit Mission in 1838, to the present day is now available . Laminated cover, 142 pages, 90 illustrations (32 in colour). Price £4.95.